Direct and simple advertising in an affordable and dynamic platform, the entry level Cabcast Basic system is ideal for the geographically small fleet predominately based in small / provincial towns. Advertising space that targets captive, affluent and local demographics is a local advertiser's dream, meaning you can command premium advertising prices, and offer your local markets a unique platform to advertise their wares. Expand your portfolio into the most innovative local advertising platform. Cabcast Basic is a simple system that uses a single secured hotspot at the taxi rank to update your content. Whenever the taxi is sat at the rank or taxi depot, Cabcast will contact your server and update its own content with the latest version of your advertisements. It can be used for simple rolling static advertisements, video loops, or for keeping up to date with local information. Cabcast Basic is priced at GBP 149 per unit for orders of 10 units or above. This price is universal across our private hire vehicle (PHV) option and our Hackney carriage option. To understand the differences between the Hackney carriage and PHV options, we have outlined this below. We offer a range of screen sizes to suit any vehicle type. If you have a smaller vehicle, we have screens of 7", 8", and 10" sizes - however for the larger vehicle, we can accommodate screen sizes of 12, and even 15". Cabcast can be tailored to meet your specific needs - call us and we'll be happy to discuss it with you. There are no buttons on the Cabcast PHV screen - this keeps the passenger's focus purely on the screen content, without any distractions. We are able to add external buttons, such as volume control, power buttons, or anything else you may require. Cabcast can be mounted in one of 2 ways. A stylish replacement headrest unit can be installed into your vehicle, allowing for the Cabcast unit to be housed tidily in a comfortable and solid housing. Alternatively, if Cabcast is to be used in a vehicle where a less permanent solution is required, we offer the unit in a housing that can be installed and removed as the user requires. 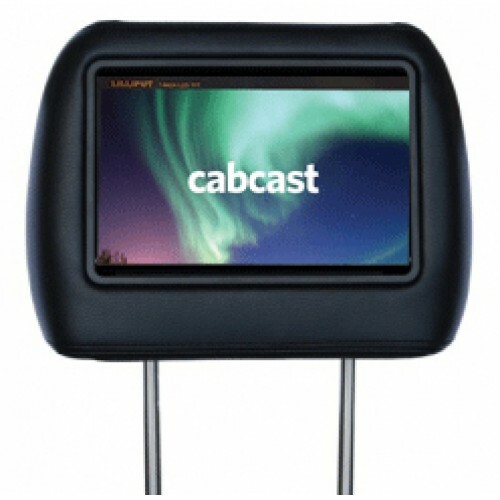 Cabcast Basic is a breeze to install into PHVs and Hackney carriages. We've made it easy to wire up to the power in both options so that you can get your network of taxis and PHVs up and running in no time. The main power is drawn from the 12V power supply. This allows the headrest to automatically power on and off with the engine. Of course, we're dedicated to helping you get Cabcast up and running, so along with comprehensive user guides, our engineers are always just a phone call away. If you are unable to install Cabcast Basic yourself, we offer a Setup & Installation service. Our qualified auto electricians will visit your base and install Cabcast in your vehicles.